The ProRep Ceramic Heater Guard for Reptiles is ideal for the protection of ceramic bulbs. This has been specially designed to provide high quality protection for 60w, 100w and 150w heaters, and is ideal for the pendant type ceramic holder. This is what makes the ProRep Ceramic Heater Guard for Reptiles perfect for most reptiles. 1mm thick perforated steel has been used to make the ProRep Ceramic Heater Guard for Reptiles. This helps to keep it very strong, which is why you will be able to depend on this heater guard to remain in excellent condition for a much longer period than other similar items. 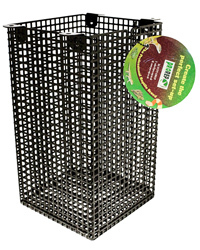 The ProRep Ceramic Heater Guard for Reptiles has a powder coated finish which remains in excellent condition for a very long time. Nice size heater guard. My boa has sat on it with no ill effects. Superb customer service.